This happened Wednesday night. Around 8:30. In the boys’ room. On Jonathan’s bed. There was screaming involved. I feel like that about adequately tells the story. But wait. There’s more. Caleb was out of town so guess who had to catch the centipede in the half light from the hallway as it raced across Jon’s sheets and tried to make a break for the crack between the beds. Ordinarily I am the absolute worst person to call if there is a bug problem, so you understand why Jonathan’s first scream was for Daddy. And then he remembered and switched to “MOMMYYYY” over and over at the top of his lungs. And also a “JACKSONNNN” or two for good measure. To make things a bit more horrifying (if that’s possible), Jackson woke up about the time I had trapped the centipede in an upside down gladware container and was trying to figure out how to get the top on without getting bit or peeing my pants. He proceeded to educate us on what happens if a centipede bites you. He has horrible timing! It took a complete bed stripping and several checks around the room with a flashlight before I could get Jonathan back to sleep. Had I known our pest control guy’s cell phone number I’m pretty sure I’d have called it. 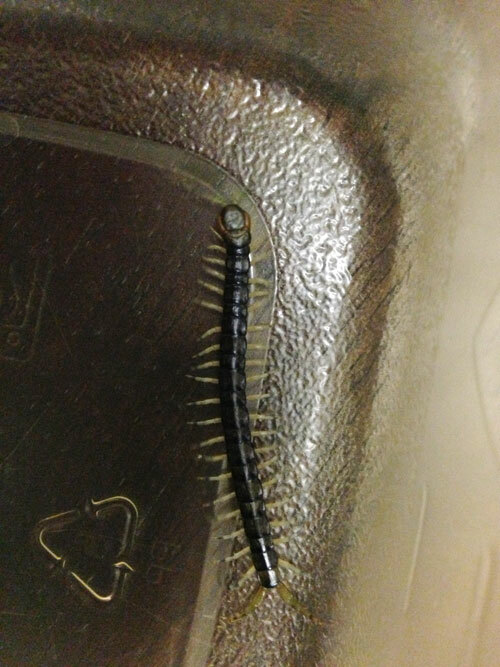 Instead, Caleb got an call full of “I do NOT live in the USA to find centipedes in the bed!” Not my finest moment okay. Side note: we’ve cheerfully employed a year round pest control service since the very first day we moved into this house. 1. our house is heavily wooded on two sides and the wildlife is prevalent. 2. having grown up in an Asian jungle, I decided long ago I will not cohabitate with lizards, rats, scorpions, roaches, or centipedes. Ever. Been there. And still not over it. So next morning I called the pest control office the minute it opened and they promised to send someone out as soon as possible. While I was waiting for said Dude to show up with his poison, I encountered a scorpion walking across the kitchen floor. I cannot make this up, guys. And I didn’t even take a picture because I was so busy pinching myself. This has to be a nightmare, but just in case it isn’t I better sit on top of the refrigerator with a can of Raid and wait for the door bell. Our house has now been drenched. I followed the guy around to make sure he was liberal with the juice. And after he complimented me several times on my ability to catch stinging critters in gladware (a skill I’d gladly give up) he explained that the high rainfall this summer coupled with the turning weather is driving the bugs up our walls, literally. The next house is going to be a high rise apartment on a huge slab of concrete. I just googled "what happens when a centipede bites you"... no thanks.